HERE HE IS––THE GRAND OLD MAN, OUR BELOVED STALLION. and now lives on Jorge's olive plantation and ranch in Australia! Many thanks and congratulations, Jorge! For information on Cappy in his new home, click here. 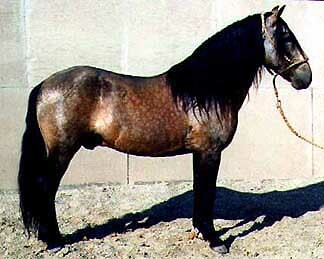 Capoeira BSN, or "Cappy", is living example of the old style Peruvian Paso stallion. 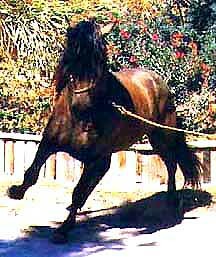 A dark buckskin, Cappy's the kind of horse that used to work all week and then show off on Sunday when the hacienda owners got together to play. He is named for the Brazilian martial art, capoeira. When you look at his photos, notice Capoeira's exceptional bone. 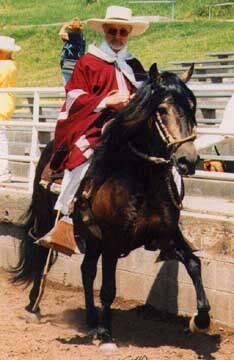 Notice that his feet are large and well shaped, meant to carry him and his rider for many years. You can't see tendons and how his feet wear very well over the Net, but he's got legs and feet "to die for". Cappy has a nice short back, good muscling, a beautiful head set and elegant Andalusian head. His temperament is very, very good. He's all stallion, but sweet. And a Multiple Champion of Champions! A NEW PAGE SHOWS CAPPY'S OFFSPRING. HE'S PASSING ON STRENGTH, BEAUTY & COLOR! 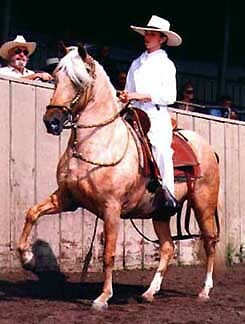 3/4 OF HIS OFFSPRING ARE PALOMINO OR BUCKSKIN! Capoeira BSN is a son of the 1989 Peruvian National Champion Breeding Stallion, *RyR Galileo. Galileo is a noted sire of champions and full brother to two time U.S. National Champion of Champions mare, *RyR Fantasia. Galileo's breeding, *AEV Sol de Paijan and Feria Cayalti, is a brilliant cross of northern bloodlines. Capoeira's mother, La Soberbia, represents the oldest and finest bloodlines of southern Peru. La Soberbia is a daughter of the late *AV As de Oro, a direct son of the legendary Sol de Oro, Viejo. 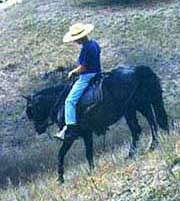 *As had one of the best sets of legs we've seen on a Peruvian Paso. 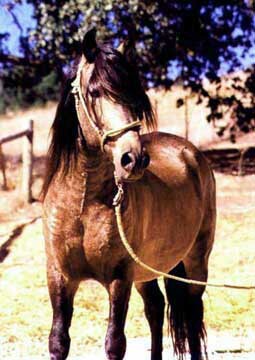 Soberbia's mother, Soberana, was a full sister to Mantequilla. 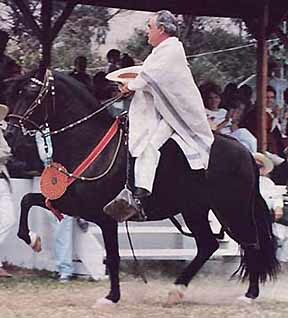 La Soberbia is an antique: the genetic equivalent to a daughter of Mantequilla by a Sol de Oro, Viejo son. With limited showing, Capoeira is a two time Champion of Champion Performance Stallion at the La Bahia show in Watsonville. 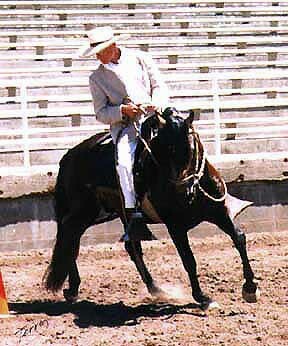 Both Championships were won against excellent horses with equally excellent show records. One more year to go for Laureado! 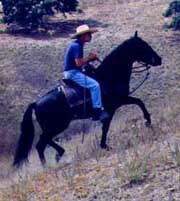 CAPOEIRA IS BARRY'S FAVORITE TRAIL HORSE. UP, DOWN, OR ALL AROUND: HE'LL TAKE YOU THERE. 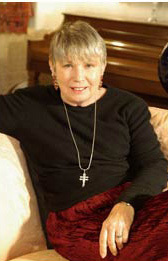 Copyright 1999- 2011 Sandra Nathan, All rights reserved.